As if the Speech Accent Archive from yesterday’s blogging wasn’t fascinating enough, it seems humans aren’t the only creatures being subjected to linguistic analysis these days. 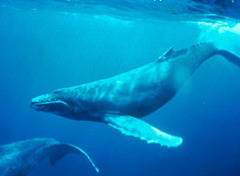 A new study appearing in the Journal of the Acoustical Society of America suggests that whales may be speaking a more complex language than previously thought. Link via New Scientist (check out the sound clips, too). I know some whales that can talk better then people.